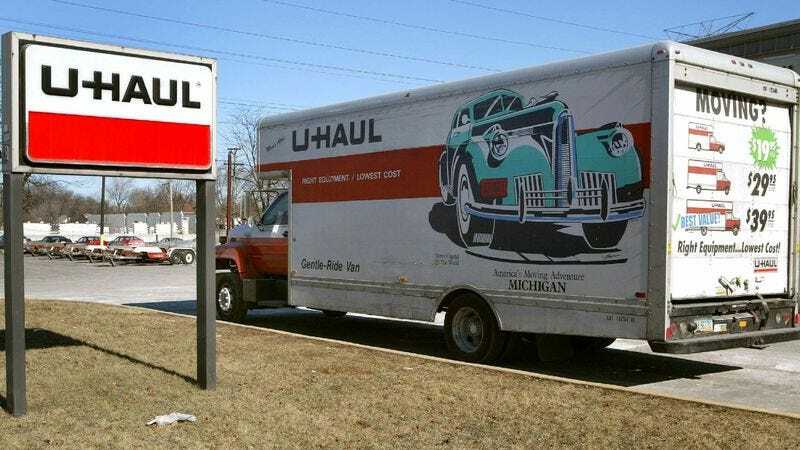 PHOENIX—Catering to a large and valuable segment of customers who have misguided visions of what city living will be like, truck rental company U-Haul announced Wednesday that it is now offering a discount to customers who will just end up moving back home in 18 months after failing to make it in a major metropolitan area. “Beginning today, we’re taking 30 percent off our mileage rate for those who pack up their belongings, head off to a large city, give their dreams a feeble shot, and then come crawling right back to the safety and security of home within a year and a half,” said U-Haul spokesman Christine Shipley, adding that the deal would apply to all 10-foot trucks designated for moving into studios and one-bedroom apartments, most of which customers will leave behind before their lease is even up. “We are also including free furniture blankets, bubble wrap, and boxes for the items that may not even be fully unpacked during the short time it takes for our customers to be spit right back out of the big city. If you’re making the big move that you truly are not prepared for at this point in your life, you can’t afford to pass up this deal.” The new offer follows U-Haul’s widely popular half-off discount for those who will take three weeks to deeply regret moving in with their significant other.